Amazon.com description: Product Description: Explore global warming with graphics, illustrations, and charts that separate climate change fact from fiction, presenting the truth about global warming in a way that's both accurate and easy to understand. Respected climate scientists Michael E. Mann and Lee R. Kump address important questions about global warming and climate change, diving into the information documented by the IPCC (Intergovernmental Panel on Climate Change) and breaking it down into clear graphics that explain complex climate questions in simple illustrations that present the truth of the global warming problem clearly. These experts take scientific findings about climate change and global warming and use analogies, striking images, and understandable graphics to make the global warming question clear to both skeptics and scientists. 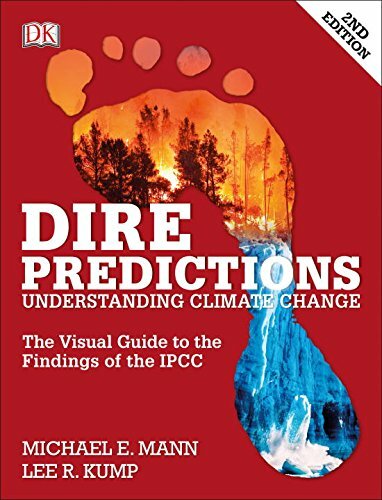 Dire Predictions shows the evidence and the causes that respected scientists have documented in IPCC findings and climate change studies â this powerful, illustrated book is updated with the latest IPCC information and is a must-read for anyone interested in understanding global warming and climate change and in joining the debate over the best way to combat global warming.